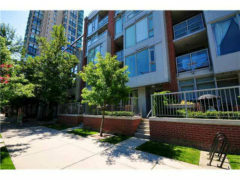 INVESTOR ALERT: This modern and stylish townhouse in the H&H building is leased until October 2013 to a great tenant at an exceptional $2800/month. Great rental and holding property. Just steps to all of the amenities in Yaletown. 2 level home offers a bright open floor plan with a fabulous chef’s kitchen with large island, breakfast bar, stainless steel appliances and granite counters. Main level also has a large storage room and powder room. Upstairs features 2 bedrooms, including a master with spa-like ensuite, 3rd bathroom and an office nook. Two patios. The building features roof gardens, private gym, social room & bike room. Secure parking. Pets allowed.